Click here to visit the Wonderful Halos facebook and like them. 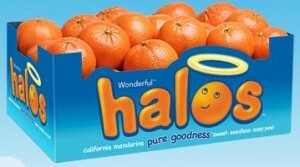 Then on the “Halos Pure Goodness” tab, click “Enter To Win,” and fill out the form to enter their sweepstakes. There will be a total of 606 winners. Good luck! 6 winners – Each Grand Prize winner will receive a Halos Bean Bag Game. 600 winners – Each First Prize winner will receive one of the following: a Halos t-shirt (ARV: $5.00), backpack (ARV: $2.00), flashlight and light up cup (ARV: $4.00), hat (ARV: $5.00) or mini basketball game (ARV: $5.00). What a sweet name for oranges!